Mickey Joe O'Boyle is an experienced local guide, storyteller and poet. He will meet your ship when it arrives at the pier. Tour lasts 2 and a half hours and returns to your ship. RESERVATIONS ESSENTIAL -- SPACE IS LIMITED !! You must book early to avoid disappointment!! This tour is customized for Cruise ship passengers only. 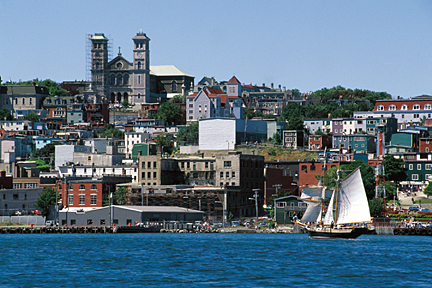 See you on O'Boyle's "Rum, Romance and Rebellion Walking Tour"
HISTORICAL WALK FOR CRUISE VISITORS TO ST JOHN'S NL FOR THIS SEPTEMBER OF THIS YEAR. I will have a large Flag, top hat and black suit. FOR PASSENGERS TO LEAVE SHIP. Have good footwear and a light windbreaker. Hat, sun screen and water. We will visit the Roman Catholic Basilica, Government House, the War Memorial. The Anglican Cathedral, the Colonial Building and walk along the narrow pathways of this ancient seaport city. And return to your cruise ship. Close to the halfway point on the tour we will have a rest stop for about 15 minutes. Looking forward to meeting you all. with an experienced local guide and actor.